Meet “The Challenge!”, the quarterly newsletter from the VCC. It brings together articles of interest to cadets, staff, parents/guardians and others interested in the activities of the Volunteer Cadet Corps. We welcome contributions from all cadets and staff, as well as parents and guardians. So, if you want to send us a few words, a suggestion for a future article, or a photograph for publication, please get in contact with us. See the back page of The Challenge! for our contact details or click here. The latest edition of our quarterly newsletter reaches its silver jubilee and in doing so is packed full of news from around the VCC. We see how the cadets from Lympstone won the coveted Cautley Cup again and read about more success in the cadet field gun competition. Our history section looks back to the First World War and a long serving cadet in Plymouth leaves in style. The first edition of The Challenge! in 2017 takes a look at the VCC Commandant’s Review at HMS Excellent as well as the largest recruit pass out in living memory. The last edition of The Challenge! in 2016 takes a look at the Corps of Drums’ activities in Plymouth as well as some of the cadets’ summer camp experiences. In this edition of The Challenge! 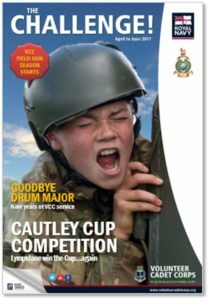 we see how the cadets at Lympstone VCC won the Cautley Cup and how HMS Sultan’s Royal Naval Cadets achieved success in the VCC Field Gun Competition. The latest edition of The Challenge! is now published packed with news from around the VCC including promotions and weekend exercises. In this edition we catch up with the cadets at their respective Summer Camps and ‘gen up’ on more Corps History. Read about Lympstone Division’s win at the Cautley and Portsmouth Cups, and see how well Portsmouth Division’s Field Gun crew got on during the competition season. You can catch up on all the editions of The Challenge! here.